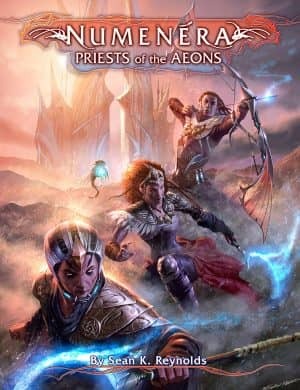 Priests of the Aeons lets you explore the Order of Truth. Learn its many secrets. Work with the Aeon Priests, discover new ways to optimize your character’s abilities and equipment, and perhaps even join the order as they seek to bring the wonders of the ancients to the Ninth World. New descriptors and foci, plus alternate tier abilities for every focus in Numenera Discovery and Numenera Destiny. Customize your character to work alongside the Aeon Priests—or to join them! New gear, cyphers, and artifacts that can be crafted by the priests of the aeons, including artifacts built specifically to make the most of your character’s abilities. An in-depth look at the Order of Truth: its philosophies, structure, and role—large or small—in your campaign. Guidelines for joining the Order of Truth, no matter what your character’s type or abilities. Sample claves, story hooks, and two complete adventures. A double-sided poster map featuring a map of the Amber Monolith on one side, and a new illustration of it on the other.